TULARE COUNTY – Politics came to an end over the Kaweah Sub-basin last June. Cities, counties, water authorities, irrigation districts and everyone else of the like chose what groundwater sustainability agency (GSA) they were going to be a part of. Now they have to answer the question: What will it take to make the over-drafted Kaweah Sub-basin sustainable? All three GSAs in the Kaweah Sub-basin are already hard at work figuring out that answer. 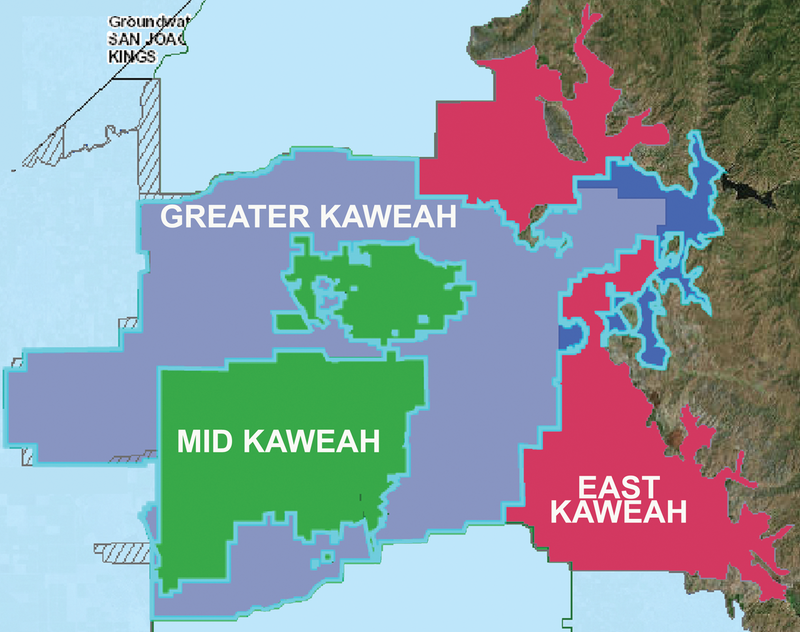 Together members of the Mid Kaweah GSA, Greater Kaweah GSA and East Kaweah GSA span the Kaweah Sub-basin. Since forming their individual GSAs they entered into a Memorandum of Understanding (MOU). Mark Larsen, coordinator of the Greater Kaweah says entering into the MOU allows them to concentrate their efforts and define some key details about the sub-basin. Michael Hagman, executive director of the East Kaweah added GEI was the firm hired to help with the tasks outlined by Larsen. To help in funding all three GSAs have put in an application for $1.5 million for the Department of Water Resources Prop. 1 grant dollars. The money will also help each GSA create their own Groundwater Sustainability Plan (GSP). Larsen said the Greater Kaweah has hired an engineering consultant to begin the process in drafting their GSP. Hagman says the East Kaweah hired Provost and Pritchard to assist in the development of the EKGSA Plan. Nothing definitive over sustainability has come to light yet, but Hagman says members of the East Kaweah are preparing for some changes regardless. Because the Kaweah Sub-basin is over drafted, members understand current groundwater pumping is not sustainable as is and will have to change as a part of any plan in the future. “All members are fully aware there will have to be additional surface supply or reduction in [ground water] demand or some combination of both. To accomplish increases of supply more surface water will have to be imported to the sub-basin likely by the Friant Contractors, while potential demand reductions include fallowing, conversion to lower water crops, better use of water supply with irrigation technology, and other such ideas,” Hagman said. GSAs have until June 2020 to have their GSPs in the place and work together toward sustainability. They hope to continue to gather information to better form their plans. Hagman says November will be the “big reveal” for the State and stakeholders. Emphasizing his point he said everyone knows they are over drafting collectively, they just don’t know by how much and in November they will have that information. “From that understanding we can develop answers to the questions of projects and programs needed to accomplish sustainability, the time it will take—mathematically calculated—and how we will cut or manage supply impacts,” Hagman said. Larsen made similar points and added a few. He said identifying areas of concern and understanding the thresholds needed to establish for basin sustainability were key. He added goals ahead are defining activities to reach sustainability while working landowners to develop a reasonable GSP while also hiring a manager to lead the Greater Kaweah long-term.